Who has not, at one point or another, played with thoughts of his ancestors, with the prehistory of his flesh and blood? I have done so many times, and many times it has not displeased me, to think of myself as Jewish. It is an idle hypothesis, a frugal and sedentary adventure that harms no one, not even the name of Israel, as my Judaism is wordless, like the songs of Mendelssohn. The magazine Crisol [“Crucible”], in its issue of January 30, has decided to gratify this retrospective hope; it speaks of my “Jewish ancestry, maliciously hidden” (the participle and the adverb amaze and delight me). Nonetheless, Borges wrote, “I am grateful for the stimulus provided by Crisol, though hope is dimming that I will ever be able to discover my link to the Table of the Breads and the Sea of Bronze; to Heine, Gleizer, and the ten Sephiroth; to Ecclesiastes and Chaplin.” A few years later, during World War II, when Borges offended both the local Germanophiles and Argentina’s dictator Juan Domingo Perón by siding with the Allies against Hitler, he was subjected to a campaign of intimidation that culminated in his demotion from librarian to inspector of poultry and rabbits in a municipal market. But the idiosyncrasy of Borges’ short, seemingly extemporaneous list of Jewish touchstones, shows that his philo-semitism—if that is a strong enough word—was not merely, or even primarily, a matter of anti-fascist politics or a romantic embrace of the cultural outsider. He associated Judaism not only with his friend Manuel Gleizer (an avant-garde publisher and bookseller) Heinrich Heine, and Charlie Chaplin (who was, in fact, no more Jewish than Borges), but with biblical wisdom, the mysteries of the Temple, and the doctrines of Kabbalah, by which Borges remained fascinated all of his life. Nor is this all. One of Borges’ early literary mentors was Alberto Gerchunoff, a Russian-Jewish immigrant who, inspired by Don Quixote, switched from Yiddish to Spanish and wrote The Jewish Gauchos of the Pampas, a series of vignettes about Argentinian Jewish cowboys that owed something to Sholem Aleichem. By the time Borges met Gerchunoff he had been obsessively reading books by and about Jews since childhood. He first discovered Kabbalah in an appendix to Longfellow’s translation of the Divine Comedy, which discusses the mystical values of the Hebrew alphabet. As an aspiring young writer, Borges read Spinoza, Gustav Meyrink’s fantasy Der Golem, Buber’s Hasidic tales, a translation of the Zohar, and almost anything else of Jewish interest he could get his hands on. (He discovered Isaac Babel before Trilling and was scandalized by Toynbee’s pseudo-historical discussion of Judaism.) Perhaps most significantly, the stories of Kafka were among his deepest literary influences. He wrote a perceptive essay on Kafka’s precursors and even translated “Before the Law,” the famous parable from The Trial. Borges’ life-long passion for lo Judío, Jewish themes, has been noted, but it has yet to be fully reckoned with in the ever-expanding world of Borges commentary. It is almost invisible, for instance, in Borges: A Life, the standard English biography by Oxford scholar Edwin Williamson. A few years ago, Penguin, Borges’ American publisher, released five small thematic collections of his writings. One was about the art of writing, another gathered many of Borges’ sonnets, a third comprised poems about darkness and blindness. (Borges became progressively blind until, in his later years, he was only able to see vaguely two or three colors and no silhouettes.) A fourth was on mysticism, and the fifth was On Argentina. This was, to some extent, a publisher’s gimmick. Borges’ genius is, perhaps, better served by eclectic juxtaposition than thematic unity. Nonetheless, it might have been interesting had the publisher decided to collect Borges’ Jewish writing, which would have included some of his very best stories, written in his literary prime. Why did Borges choose that letter? He never gave a definitive answer, but in his writing, Hebrew plays an important role. It is used in different places to announce, perhaps playfully, that God communicates with humans in that language, and not in Latin or any other. It is the ur-language, the natural language of the universe. Emma Zunz may or may not have been based on a real person. But she is almost unique among Borges’ creations in not being interested in literature. Jaromir Hladik, the protagonist of “The Secret Miracle” is more typical. Hladik is a Czech writer in Prague, whom the Nazis imprison in 1939 for the crime of being a Jew. He is a writer of a metaphysical bent, who has written on “Boehme, Ibn Ezra, and Fludd,” and translated the mysterious kabbalistic text Sefer Yetzirah, which purports to show how the world was created from permutations of the Hebrew alphabet. Hladik, Borges writes, “like every other writer, measured other men’s virtues by what they had accomplished, yet asked that other men measure him by what he someday planned to do.” None of his works strike him as enduring—with the exception of an unfinished play, The Enemies. In desperation, Hladik asks God for a miracle. Borges’ story is remarkable in that the miracle does take place, though secretly: “the German bullet would kill him at the determined hour, in Hladik’s mind a year would pass between the order to fire and the discharge of the rifles.” The external clock stops ticking but internally he has an entire year to finish writing the play. The plot, which turns on notions of time, infinity, and a kind of message (the bullet that destroys European Jewry in something like slow motion) is a tribute to Kafka. In fact, Hladik’s residence on Zeltregasse is a direct homage, since it’s where Kafka himself lived. The mysteries of the divine, a theme in Kafka’s oeuvre, are also Borges’ concern here. Another story that would have to be in any collection of Borges’ Jewish stories is “Death and the Compass.” It is a mystery that begins with a murder at the “Third Talmudic Congress ” and whose solution lies in the Tetragrammaton, the ineffable name of God. Spinoza also makes an appearance. The protagonist is detective Erik Lönnrot, a Gentile with a Borgesian interest in Jewish texts. His task is to solve a series of deaths committed in a mysteriously geometrical order: at the points of an equilateral triangle (North, East, and West) and numerically on the same day of consecutive months (December 3, January 3, February 3). Is it significant that this Jewish victim has virtually the same surname as that of Borges’ possibly-putative-would-be-Jewish forebears? No doubt, as it showcases his empathy with Jews, and his desire to see himself as part of the persecuted. The story was collected in Ficciones in 1944, at the height of the Nazi annihilation of European Jews. The pattern continues with an apparent third victim. Realizing that only the fourth letter of the divine name is missing, Lönnrot deduces where a fourth and last murder is likely to take place. He goes there only to find out he himself is the fourth and final victim. Borges’ is a famously cerebral writer and there is certainly something cold in “Death and the Compass,” including the literary games he plays with Jewish motifs and characters. But this is true of all of his work. His Jewish characters are a bit bloodless, not so much because of his failure to get beyond stereotypes, but because he was a writer of metaphysical fiction and philosophical and theological poems. beautiful like a lion at noon. What is a nation? My first reaction is to offer a geographical answer, but it would be insufficient. Instead, let us envision a nation as the series of memories stored at the heart of a people . . . To me there isn’t a clearer example of a nation than Israel, whose origins are almost confused with the world entire . . . Memory is often approached … as [either] a barren collection of dates [or] a catalog of curiosities. But there’s another approach, neither endorsed by historians, nor by students of folklore: memory as experience incarnated in a people. This, precisely, is what I find in Agnon. Ilan Stavans is Lewis-Sebring Professor in Latin American and Latino Culture at Amherst College. His illustrated memoir Return to Centro Histórico: A Mexican Jew Looks for His Roots (Rutgers University Press) was just published in January. The FSG Book of Twentieth-Century Latin American Poetry (Farrar, Straus and Giroux), which he edited, has recently appeared in paperback. He is currently at work on a biography of Isaac Bashevis Singer. Ilan is so prolific and diversified. His research makes you think abt Borges being so Judio but not proven to have true ancestry. I know what that means! 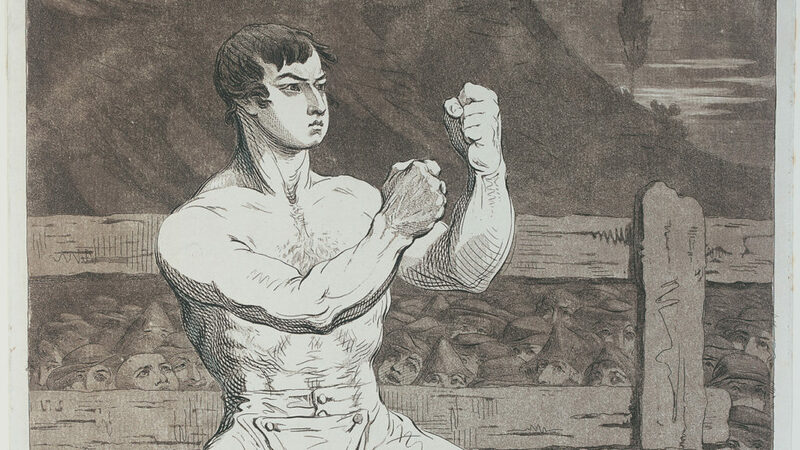 The history of Jewish boxers such as Daniel Mendoza in England is as central to understanding the entry of Jews into European society as the better-known and much-researched history of Jewish salonnières and intellectuals in Berlin and Vienna. At age 97, Herman Wouk returns to Moses and goes postmodern. The career and life of Yehuda Amital—unconventional, unpredictable, and free of clichés.